In the dream, I was in eastern California, trying to get to Yosemite National Park -- eager to get there, determined to get there, demanding to get there. One problem: I was on a boat. That dream occurred before I agreed to update the condo, so I hope that now my mode of transportation, metaphorically speaking, is more appropriate. Under most circumstances, it doesn't get any better than being on a boat. 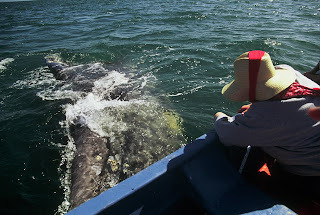 For 27 years, I've sat in small boats next to large whales. I've watched whales off both U.S. coasts, in Trinity Bay off Newfoundland, off Vancouver Island in British Columbia, in Patagonian waters off Argentina and in Baja California, Mexico. Before you can do any whale watching, you have to put in some time waiting for the whales to appear. I know that from experience, plus I've written books and numerous newspaper and magazine articles about whales, whale watching and whale waiting. And so I wait, all the while wanting to move to San Francisco and live close to my really big friends. The first time I visited my son in The City, we stopped at Ocean Beach, near the famous Cliff House restaurant. I looked across the street and saw houses, the homes of people who can get up every morning, cross the road and greet the Pacific Ocean. "What is this neighborhood?" I asked. "I want to live here." "The Sunset (particularly the outer Sunset) can be foggy for many consecutive days during summer. The Sunset's finest weather is usually from mid September through October, when regional air patterns transition from onshore to offshore weather and the area is free of fog." That six weeks of beautiful weather is bestowed on all of The City, and oh, how I would hate to miss it this year, no matter where I end up living. “The walls of the valley are made up of rocks, mountains in size, partly separated from each other by side cañons and gorges; and they are so sheer in front, and so compactly and harmoniously built together on a level floor, that the place, comprehensively seen, looks like some immense hall or temple lighted from above. But no temple made with hands can compare with Yosemite. I first went to Yosemite to meet a waterfall, as research for my book "The Extreme Earth: Waterfalls" (Chelsea House 2007). Said to be the highest free-falling waterfall in North America and the fifth tallest in the world, Yosemite Falls plunges 2,425 feet into Yosemite Valley. I was entranced with that waterfall and by several others in the park. I also was captivated by the granite -- the texture, the sheen, the striations. Twelve different types of granite have been identified in Yosemite National Park, and one large boulder abandoned by a glacier in the Merced River is another type altogether. The story of the formation of the valley is amazing, too, a tale of how El Capitan and Half Dome were formed in the course of the assault by massive rivers of ice that carved the valley. About 20 minutes out from the San Francisco Airport, American Airlines flies right over Yosemite Valley, and if you are paying attention, you can wave to Half Dome, to El Capitan and to Bridalveil Fall. But before I fly to San Francisco again, before I sweep sand from my driveway, before I race across a road to hear the ocean roar, taste salt on my tongue and revel in my natural element, I have to wait. So I’m sitting in Borders, sipping a latte I got free with Borders Bonus Points, eating an oatmeal cookie that is bigger than my head, reading the New York Times. This is my reward for enduring six days of crazy in the condo while my painter and my handyman made magic in a frenzy of updating. I bought the paper because I wanted to smear my fingers with ink, feel the texture of the reporting, as I read about Senator Edward M. Kennedy. His death is weighty news, and reading the stories on line simply is not satisfying. Besides, I was there for the Kennedy Years, and I’ve been feeling melancholy about the end of this particular era. One day near the end of Philip’s life (he died in January 2006), I walked into his hospital room. “How are you feeling?” I asked. He said he was fine. Philip had AIDS, and he had just been diagnosed with a brain tumor. Memories flooded through me, reminding me of lessons I’d learned from Philip. So I’m sitting in Borders, sipping a latte I got free with Borders Bonus Points, eating an oatmeal cookie that is bigger than my head, reading the New York Times, crying. Then I remember the most important lesson I learned from Philip, obviously wisdom that Senator Kennedy also possessed: We all are dying, but only some of us admit it. Once you admit it, you can allow yourself to be overcome with emotional paralysis or you can get on with your life, projecting vigor and a determination to keep on going until the minute that your life is over. No more whining about the process of ripping up life as I know it and heading West. No more freaking out about spending money here that I have saved for there. No more frittering away the gifts of today worrying about the uncertainties of tomorrow. Thanks, Senator Kennedy and sweet Philip, for the reminder. And to the people at Borders – sorry about that. Good news – the updating and renovating of the condo is almost complete. Unless, of course, I cave and get new floor covering in the LR, DR and hall. That means taking everything out of the china cabinet, the buffet and the book shelves all over again, but there is far less in the rooms to move than there once was. Some people have said do it; others have suggested offering a “carpet credit” to potential buyers. The latter makes sense to me, because what if condo shoppers hate what I pick? I’ve heard more than one story about people who put in new carpeting, sold the house and moved – and then heard from neighbors just days later that the new carpeting was out on the lawn and the new owners were installing new floor coverings. A “carpet credit” would help someone choose what they want, instead of what I want. I want to move to San Francisco! I want to move so I can live by the sea – go there every day if I choose. I want to move so I can be in the family circle that waits for me there. I want to move so I can volunteer one day a week for the Oceanic Society, writing for them and helping out on whale-watch boats. I SEE me there, doing this! Late last night, I pondered my newly painted, posy-colored walls and woodwork. It looks fresh and clean – neutral, so anyone’s stuff will fit right in. It looks fine. After all, it’s all about pleasing the would-be home buyer. Then I remembered a particularly anti-posy wall in my old house in Shrewsbury. Artist and book author David Peters painted a humpback whale on my bedroom wall, one-fifth the full size of the actual 40-foot-long magnificent mammal. Every morning when I woke up, before I put on my glasses, I would see a humpback whale swimming across the room. No matter what you think of my Whale Wall -- and I know some may think it is really weird – I SOLD THE HOUSE IN SHREWSBURY WITHOUT PAINTING OVER THAT WHALE. Did the new owner paint the wall? Probably. Wow -- just when I needed a boost, before I remembered that I know how to ask for help, a string of people showed up to say just what I needed to hear. Consider this a Thanksgiving Blog -- never mind that today is a summer day with a spring feel to it. First, in response to my last post came a generous email from Bernice: "I loved your condo the way it was. When you walked in, it said to me 'Pat lives here.' But since you now want it to say, 'Pat lived here,' I guess you are doing the right thing. Just focus on how wonderful it will be to say good-bye to it when you close the door on your way to S.F." Here I was, busy mourning that the Salmon Sanctuary was changing drastically, failing to take into consideration that it must, to make way for a new owner. In an odd way, this is related to how you are able to send your beloved children halfway across the country to college only because with each passing year in high school, they increasingly annoy you. By the time they are seniors, you are eager to help them pack. Next, Curtis showed up. We walked a few blocks and had lunch at a great little spot. Curtis mentioned he had been to five funeral services in seven days, and had just come from visiting a friend who recently had back surgery. We stared at one another a few seconds, put down our forks and shared a fist bump. "To good health," we said. Before he left, Curtis came in to meet Pete the Painter and to pick up two Souvenirs of Pat that I had promised him, both Sumo related. For reasons neither of us can fully explain, we admire and honor the ancient art of Sumo, and I just happened to have two posters here. Friday evening, my cousin Karen stopped in on her way home from work. I gave her some glassware that had belonged to our grandmother, and then she looked through some of my posters and art. Karen is a self-described "beachy person," so she left with some images of beaches, a concrete mermaid and a metal sculpture of the sun. On Saturday, Susan and Denny came by to carry off a three-foot-tall ceramic statue of a giraffe. They ended up leaving with a floor lamp, a bottle of bourbon and half a bag of my favorite bread. (Long story; never mind.) Then Judy and Scott popped in to pick up two bookcases that they had kindly loaned me. I sent them home with some excess liquor, a bit of bread and a toy stuffed bear. Carolyn dropped in later, and helped me rearrange the storage closet so that empty packing boxes were within reach, instead of shoved to the back, behind superfluous furniture. In return, I sent her home with a stack of books for use in her fourth-grade classroom. This habit I have of sending people home with stuff they did not expect has served me well over the years, but it is not a behavior that is original with my family. Indigenous people of the Pacific Northwest Coast practice potlatch, a word that means "to give away" or "a gift." Legend has it that tribal members compete to see who can give away the most, gaining great honor -- not to mention a decluttered home -- in the process. Today, I contemplated cleaning the baseboards so they will be ready for Pete when he arrives Monday to paint them. Once, in another home long ago and about 10 miles away, I painted right over a dead fly clinging to the baseboard, barely pausing to feel bad about the insect's demise. Pete is not that kind of painter. "You're not working with kids here," he always says. The phone rang, and Champe asked if I was up for running out the door for coffee. Let's see -- clean the baseboards or go out and play? I went, but not before showing off the transformation in progress. When Champe walked in the kitchen, her jaw dropped. Yes, kitchen cabinets look funny without doors, but oh my, how convenient! After a run to Starbucks, I stuffed some borrowed books into envelopes and mailed them at the Post Office, I hauled a full box and an empty CD tower to the storage space in the basement and I've just finished cleaning the damn baseboards. My reward? Finding my friend George's quote (see "comments" on the previous post) from my personal anthem ("Move On") from Stephen Sondheim's "Sunday in the Park with George." Thanks for that, George. And thanks Bernice, Curtis, Karen, Susan, Denny, Judy, Scott, Carolyn and Champe. Thanks, too, to people who helped with onerous tasks earlier in the week and to people who will be pitching in soon. All of you have reminded me that I do not have to do this alone. What a relief! Goodbye, orange walls. Goodbye, dark kitchen cabinets. Goodbye, lotus-shaped light fixture. Refreshing the condo has begun. After I agreed to let Pete the Painter brighten up the entry way, the long hall and the dining room, by the end of the first day, I had signed him up to paint the living room too. And all the woodwork. And the doors. Two years ago, I am told, home buyers wanted something interesting to fix up, personalize with their own color preferences. Today, I am told, home buyers want to move their stuff into a place with cream-colored walls, woodwork and carpeting. Perhaps this is a much-needed step of separation, prying me loose from my beloved condo, where almost 11 years ago Pete painted everything variations on a color best described as poached salmon. The Salmon Sanctuary, I called it. Maybe as the new color – a creamy hue called Posy – goes on the walls, I will start thinking of the condo as belonging to someone else, that new owner who likes everything pale. On the other hand, Pete just told me a story about a job he did for a realtor. When the would-be sellers saw the place transformed, they fell in love with their place all over again and decided not to move. The realtor was annoyed, but surely she got over it. Has everyone who has come through (24 people in three months) hated the salmon walls, woodwork and carpeting? No. A few said outright it was not to their taste. Some had no comment. Three potential customers admired the color and commented how nicely it acts as a neutral. One adored it. That woman also liked my art, and said if she moved in, she would leave everything just the way it was. She didn’t, however, offer a contract, and that’s what we’re after. I’m working on it. First, I am saying goodbye to the condo as I knew it. This weekend, the condo will have been on the market for three months. So much for a quick sale with the condo “as is.” Since May, I have decluttered enthusiastically but otherwise rejected suggestions from the agent and also from friends to “freshen” the condo. He reminded me what one month’s rent in San Francisco will cost me. Then he said it’s time I was willing to spend close to that on the condo in the hope that the improvements will result in a sale. • Paint the entry way. • Paint the long hall. • Paint the dining room. • Repair cracked tiles in the bathroom floor. • Replace some missing grout in the kitchen floor’s terra cotta tiles. • Paint the kitchen cabinets. “You have THE UGLIEST kitchen cabinets I have ever seen,” offered one friend. She has said this more than once. She is right. I also have an older laminate countertop and older carpeting. I admit it. I have chosen to spend discretionary funds on plane tickets, not on updating the condo. Last Thursday I had lunch with five buddies from my water exercise class. I brought fortune cookies to the table, and ripped mine open immediately. I read it and howled. “Listen to the wisdom of the old,” it read. Everyone at the table was older than me, and I am not young. “What should I do to the condo, oh wise older women?” I asked. • Do everything the agent suggests. • Do only what you can afford. • Do absolutely nothing except lower the price. The painter is coming over on Wednesday. Stay tuned. For emotional support we turn today – almost three months since I put the condo on the market – to a dead actor and a fictional character from a movie. Drum roll, please – I give you Ruth Gordon and Han Solo. What an unlikely pair, you say? I liked that then and I like that now, especially considering that there are currently 19 other 2BD 2BA condos in Creve Coeur available for under $158,000. Gordon went on to say that had she faced facts in her youth, she never would have become an actor. She was short (5’1”), she grew up in a small town (Quincy, Mass.) and she didn’t know anyone who had become an actor, or even anyone who knew anyone who had become an actor. She also was not particularly pretty, though she was perfectly pleasant looking. “How does someone like that become an actor?” Gordon asked in the interview. The question was hypothetical. She won an Oscar, an Emmy and two Golden Globe Awards and she also wrote plays, film scripts and books. Han Solo, that’s your cue. In the first “Star Wars” movie, at one point Han Solo is trying to maneuver the dilapidated X-wing fighter through a field of asteroids. Ever helpful, C3PO starts to rattle off the odds of the plane making it through the field. That’s a great sentence to repeat when doctors rattle off statistics (means, medians and the like), stages of disease and grades of tumors. I do not have fulfilling relationships with numbers, especially scary numbers, so why learn them? If you learn them, won’t they just flit around in your brain and drive you crazy when you could concentrate instead on working with your doctors in an effort to save your own life? “Never tell me the odds.” That’s what I told my doctors 14 years ago, and now I walk around the condo muttering the mantra, instead of struggling to calculate the percentage of people looking for 2BD 2BA condos in Creve Coeur versus the glut of such condos in the neighborhood. So that’s what’s up here. I’m not facing facts and I’m not figuring out the odds of selling the place. When I move, Maggie the Cat will move with me. She is 14, and has been with me for 12 years. Most likely, moving to California will annoy her immensely, but so far, moving Maggie appears to be the best option. On the American Airlines web site, I read all about flying with pets. Then I called the airline to discuss some details that the web site does not address. A cat lover happened to take my call, and he had plenty of advice. “Buy her a harness and a leash,” he said. “When you go through security, you have to take the cat out of the carrier and walk with her through the screening machine.” He added that Maggie also would need an ID tag with her address in San Francisco and my cell phone number. Next, I called the veterinarian’s office for advice about harnesses, leashes and ID tags. The receptionist suggested I go straight to PETCO and see what was available. At PETCO, I lucked out. The sales clerk’s last job was with the Transportation Security Administration, and she had plenty of tips. No matter how crazy you sound in a pet store, the staff has heard crazier. PETCO had a new supply of harnesses, a different style from the traditional strappy ensembles. The new style looks like a cross between a kerchief and a bikini bottom. “Some cats slip out of the strap harnesses, but I’ve had good reports on this new style,” said the clerk. Unfortunately, the harnesses come only in pink. Pink is a pale, washed-out color assigned to baby girls, a throwback to the day when baby girls were expected to grow up docile and submissive and undemanding. Raspberry is vibrant. Red rocks. Pink stinks. Perhaps the worst abuse of pink comes from people who think if they wear a pink tee shirt or buy a pink KitchenAid mixer or eat yogurt from a container decorated with a pink ribbon that they are somehow putting an end to the epidemic that is breast cancer. That’s just not how it works. Do I appreciate support for women experiencing breast cancer? Absolutely – I’ve had it, and you need all the help you can get. I am wholeheartedly in favor of putting more research dollars into isolating the cause of this insidious disease. But I become downright crabby when told that “thinking pink” will lead to a cure. Does the sky turn a delicate pink color from time to time? Yes, and I revel in it. Are some flowers a breathtaking shade of pink? Of course, and I celebrate their beauty. Does my pale, freckled skin take on a pink hue after about 15 minutes in the sun? Oh yes, and that’s fine. Otherwise, pink is off limits in my life. Yet this particular cat harness, said to be the safest, comes only in pink. Worse, the only cat leash on sale also was pink – shiny, sparkly pink. I bought the harness. I bought the leash. I also bought the ruby-colored, heart-shaped ID tag because (I blush to admit) it looks nice with the harness and leash. “The tag will be attached here, on the top of the harness,” the clerk pointed out. “Look -- there’s no way the tip of the tag can poke Maggie’s skin.” She was right. Now Maggie is ready to go. First, of course, I must sell the condo. And now I have a deadline. On Nov. 18, American Airlines will no longer offer direct flights from St. Louis to San Francisco. I’d hate to ask a 14-year-old cat, a cat that gets car sick on short drives, a cat dressed all in pink -- to change planes. What do you know about the lives of your ancestors? I'm not talking about 3.2-million-year-old Lucy, but your grandparents and your great-grandparents. What were their lives like, what about them would surprise you, and what about you would surprise them? Some of us know a bit – he had red hair, she taught herself to play the piano, he was a produce vendor, she bought expensive shoes, at least until her first child was born. Some of us waited too late to find out their stories. “Tell me who you are,” I whispered to a photo of my great-grandfather. He chose not to reply, so I scanned the image and moved on to the next mystery. As I sort through my belongings in preparation for moving, I’ve spent a lot of time going through old photos. I spent the day scanning some of those photos, trying to put them in some logical order. Unfortunately, he didn’t practice what he preached, and I have – had – boxes of pictures of people I cannot identify, friends of my parents, friends of friends of my parents, maybe even distant relatives. I had no idea who most of the people in the photos were. Of course, I recognize my relatives, but I know little about their lives. That seems sad. We owe who we are today in part to those who came before us. On his splendid Writer’s Almanac web site http://writersalmanac.publicradio.org/) last week, Garrison Keillor wrote a moving piece about Isabel Allende’s response to the news that her grandfather was dying. Allende was in exile in Venezuela and could not return to Chile to be with her grandfather. “So she started to write him a letter, to reassure him that she wouldn't forget all his stories and memories,” Keillor writes. That letter expanded into a 500-page book manuscript that was Allende’s first novel, “The House of the Spirits,” published in 1985. Maybe that’s the secret. Maybe if we started writing letters to our ancestors, we could slip inside their lives, add to the facts we already know and discover what sort of lives they might have lived. Or, if a 500-page letter sounds too intimidating, consider reading “Where I Am From,” a rich poem by George Ella Lyon. You will find it on her web site at www.georgeellalyon.com. You can even listen to her read it. One day in 1980 I was driving the back roads of Kentucky, looking for a big white house that squats on a tobacco farm, a house where my mother Bonnie spent much of her youth in the company of loving relatives, a house where I got to chase chickens, talk to cows and pump my own drinking water during a few summer visits when I was a child. That day in 1980, I was 32, and had been out of touch with the Kentucky relatives for at least a decade. Driving along an unmarked road, I recognized the house right away. I stopped at the gate, opened it and drove up the long winding drive. I parked in front of the house. S.O.S. -- that's my motto: Stay Outta Stores. If you don't go in stores, you don't buy stuff. That said, like my friend Philip, I do occasionally allow myself to be lured into late-night, on-line shopping. The other night, I was just ready to hit "Buy" on a crazy purchase -- a $69.95 vegetable bowl -- when I realized that this bowl was not the solution. The solution was shopping, going into real stores. In preparation for moving, I meander around the house asking myself what I treasure. That, apparently, is how you figure out what to take and what to leave behind when you head out to a new life. Now, I like my dark green Bennington Pottery dishes, but I treasure my whale-and-dolphin pattern Mikasa dishes because they were a gift some years ago from my Five Favorite Female Friends. So no contest. The ocean-theme dishes will accompany me to San Francisco, where, by glorious coincidence, there is an ocean. I have enough Bennington Pottery dishes to feed 10. I have enough Mikasa dishes to feed four. I am selling the dining room furniture, as I anticipate renting a small place. Fine, I thought. I'll feed no more than four people at any one time. But I sure could use a serving bowl. I found a vegetable bowl that matched my dishes at www.replacements.com. With tax and shipping, the price was over $70. The time was 1:23 a.m. Just before I clicked on "Buy," the voice of reason intoned: "STOP! You can buy plain white serving dishes, probably several of them, for this much money. Just go to a store." I scored big time at my first stop: white Dansk serving dishes (big bowl, platter, sugar bowl, cream pitcher), originally $84, marked down to $14.95. Perfect. Done. Outta there. Mission accomplished. No -- wait. Maybe, I thought, I needed to buy another set of dishes that complements the whale dishes, in case I need to feed five or six people at once. It could happen. And from what I understand, paper plates are frowned upon in California. In 24 hours, I visited Bed Bath & Beyond, Kohls, Crate and Daryl (er...Barrel,) Pier 1, Target, Tuesday Morning, Marshall's and TJ Maxx. I strolled up and down the Housewares aisles, clutching one of my salad plates so I could try to match the blue on the sea creatures. I bought some pretty blue Melamine/Bamboo dishes with white bowls. Thank goodness that's over, I thought. My waking thought the next morning was this: I hate plastic dishes. Furthermore, I don't want blue dishes. I took everything back and started over. Hmmm -- the whale dinnerware has a smidgen of pale yellow in the pattern, on the nautical rope. That's it! Yellow dishes! Perfect! I raced off to Kohls. They had yellow Fiestaware. Too bright. They had a mellow yellow stoneware. Humming along with the old Donovan tune, I held up my whale salad plate. A match! It looked really nice, and the dishes were on sale. Loading the yellow dishes into one of those horrid canvas carts, I noticed that the Food Network dinnerware also was marked 30 percent off. White dishes? Really? Stark white? I held up my little plate. The background, of course, is white. The whales and dolphins are a soft, muted blue, and there is that bit of yellow I mentioned earlier. The round white dishes looked great next to my ocean-theme plate. The square white dishes looked even better! And next to the plates was a set of three Food Network serving bowls -- oval white bowls, in graduated sizes. On sale. The Food Network dinnerware is mine now. Did this 24-hour bout of compulsive shopping get me closer to a moving date? No. But somehow it feels like progress. "I bought new dishes," I said to a friend this afternoon. He replied, "Oh, did you need new dishes?"